Cloud accounting services—software stored and accessed online—is an attractive option for small business owners. When using cloud accounting software, IT tasks such as version upgrades and data backup are managed by the application vendor. In looking at small business accounting options, CIO.com specifically looked for applications designed to meet both the budget and the needs of a typical small office or small business. We chose five cloud accounting service options available cost $20 or less per month and are easy to use—even for small business owners with little or no experience with accounting tasks. FreshBooks is a simple cloud accounting application designed to help small business owners to get organized and get paid. Since it's a hosted accounting service, you can access your business data everywhere—on a mobile device or desktop computer—and your data is secure and backed up for you. FreshBooks features options for online payments, expense tracking, time-tracking and accounting reports and taxes. Highlights include customizing invoices, sending late payment reminders, automatic and recurring-expense tracking, managing different rates for multiple projects and profit/loss reports. Small business owners will appreciate FreshBooks' guided step-by-step wizard and help boxes that appear each time you perform a new task, such as create a new invoice or add a new client to your records. As you familiarize yourself with FreshBooks, you can turn these helpful tips off. 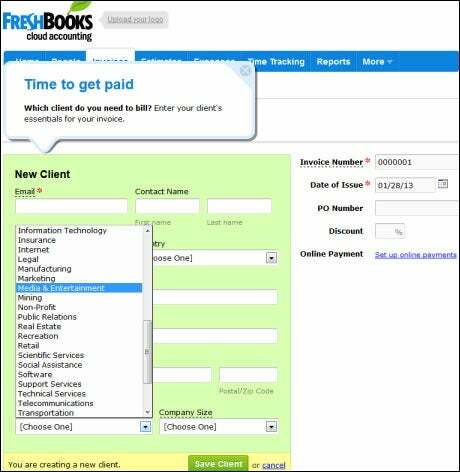 The FreshBooks Help boxes guide you through the process of configuring accounts and records. FreshBooks is free for 30 days, with the basic business plan starting at $19.95 per month. There's also an add-on store where you'll find third-party applications to add new features and functionality to FreshBooks. Some apps are free—such as the Constant Contact Export and the FreshBooks Connector for Sage Peachtree (now known as Sage 50)—while others are available on a monthly subscription basis. QuickBooks Online Simple Start makes creating invoices and downloading bank transactions, well, simple. Today, QuickBooks is synonymous with small business accounting. While a number of standalone and hosted versions are available, QuickBooks Online Simple Start is a good value for small office accounting needs. The online version is $12.95 per month and includes a 30-day free trial. This software makes it easy to create invoices, track sales and expenses, download banking transactions and access business data on any mobile device. Other handy features in Online Simple Start include check printing and exporting data to Microsoft Excel. If you need a little more functionality than QuickBooks Online provides, there are a few add-ons. These include the "Payroll Bundle" to pay your employees and a merchant service app to accept debit, credit cards and checks in QuickBooks Online. Kashoo is another cloud accounting service worth a look. It's a simple accounting app for small businesses offering anytime access from an iPad or Web browser. Features for the small business include connecting to online bank accounts and credit cards, professional invoices, simple dashboards and options to categorize income and expenses specifically for tax reporting. In addition, you can easily share your business data with your accountant online. Finally, Kashoo boasts secure, double-entry accounting for bank reconciliation and financial statements. Kashoo is priced at $16 per month. A free version is available; however, users are limited to 20 transactions each month. Outright is an easy-to-use cloud accounting system that lets small business ecommerce owners organize and keep track of sales and finances in one place. At a glance, you can see where money is going, view profit/loss statements and see who your customers are. You can link existing accounts such as banks, credit cards, Paypal, eBay, your own Web store or FreshBooks to Outright, and you can import your existing transaction history. From then on, Outright downloads your new data each day. Another useful feature: Outright organizes all of your data into IRS-approved tax categories, potentially lowering the workload and headache level at tax time. Small business owners on the go will appreciate the Outright iPhone app; with the mobile app, you can stay on top of your business and enter travel expenses and mileage from the road. Outright offers a free account, but small businesses are more likely to use the Plus version ($9.95 per month), which offers more features than the free version. With Xero, you can customize reports and templates to fit your small business needs. With Xero online accounting, you can share access to the latest numbers and check cash flow in real-time. Once loaded, Xero offers a dashboard to quickly view your bank balances, invoices, bills and expense claims. There's also an interactive graph to show money going in and out; you can also monitor specific data accounts from the dashboard. One standout feature in Xero is the capability to collaborate online so small business employees can work as a team on financials. You can share your data and collaborate with your accountant and bookkeeper to get the advice you need. Xero lets you invite an unlimited number of people for free; you control what each person can see. The invoicing system lets you customize invoices and connect with your customers through online invoicing. There are also options to create repeating invoices and schedule bill payments, and all payments, returns and credits are tracked automatically. Pricing for Xero starts at $19 per month. Mobile apps for Apple, Android and Blackberry are available. Third-party add-ons can expand Xero functionality by incorporating CRM, inventory management, invoicing, job systems and other specialized business tasks. Based in Nova Scotia, Canada, Vangie Beal has been covering small business, electronic commerce and Internet technology for more than a decade. You can tweet with her online @AuroraGG. Follow everything from CIO.com on Twitter @CIOonline, Facebook, Google + and LinkedIn.